A cafe grows and does even more good! I will confess that when I saw that a burger place called Flying Star Cafe was opening in Santa Fe’s Railyard District I was less than enthusiastic and then once they opened and posted a sign out front listing “items purchased at the farmers market” I had a hunch that this was nothing more than greenwashing…I must admit my instincts were really wrong on this one! Not long ago I was returning from L.A. where I had attended ExpoWest-the largest trade show for the natural and organic food & products industry -and at the Albuquerque airport I saw a couple carrying a bag from the Expo. I walked over and asked if they had been at the show, obvious since they had the bag, and of course they had. Well it turned out they were the owners of the Flying Star Cafe and talk about committed and knowledgeable, they could give lessons in what it means to operate a food business that is always trying to be as sustainable as possible. 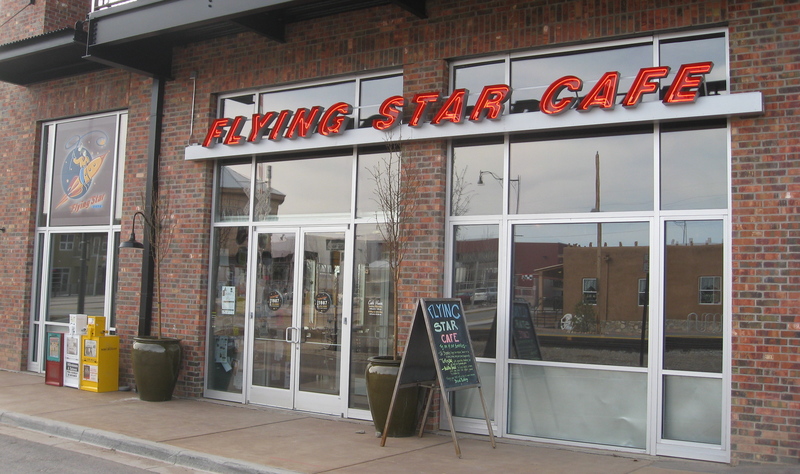 I had a chance to sit down with Jean Bernstein, one-half of the couple that own the Flying Star Cafe, at the Santa Fe location to learn about the cafe from its beginnings in 1987 when they started as a Double Rainbow ice cream franchise, to now with nine Flying Star locations and nine Satellite Coffee houses. It has been a long road for the Bernstein’s but some things have not changed and that is their love of food and their commitment to bring the best, and that means healthier, products to their customers. Not only do they care about how the food tastes but they are relentless in finding the cleanest, sustainable products and have gone to great lengths to source products and influence the industry wherever they can. Their web site lists where products come from and they are committed to organic, natural and local products as much as is possible, and this means organic tofu and soymilk (even moving away from Silk to Pacific Naturals! ), rBGH-Free milk, organic rice, oatmeal and peanut butter. Many items are coming from local food producers including honey, tortillas, pecans, milk, green chiles and even the turkey sausage. Jean and Mark were instrumental in getting an experimental program started with one of the largest egg producers in the US to produce Certified Organic/American Humane Certified eggs. The experiment has been a great success and eggs at Flying Star Cafe only come from the two dedicated farms with these certifications. There are advantages to being a big company, they have 750 employees, and that is when you say you want something large suppliers listen. I loved it when Jean told me they don’t want food in the cafe that has any “creepy stuff” in it, that is speaking my language. These owners are creating changes within the food industry. Buying from Sysco was limiting in many ways but through their perseverance products that had not been available through them now are, and that means they are also available for other businesses. Another example of a change that they were able to make is in the cage-free, vegetarian feed and drug-free chickens that they buy. Initially a regular chicken farm Springer Mountain Farms converted most of their chickens to a clean diet. They are the only poultry company in the US that is American Humane certified. This change was initiated after meeting the Bernstein’s at a trade show. Their products are now available through Sysco which means a larger distribution for hormone and antibiotic free, humanely raised chickens. Now I know that some may argue that any animals raised for slaughter cannot be humane, but as long as there are meat and chicken eaters out there if we can improve how animals are raised and slaughtered this is progress. The pollution generated from large scale factory farms is worsened by the medicines the animals are given, which is now showing up in groundwater across the country, so eliminating this is a big step in the right direction. 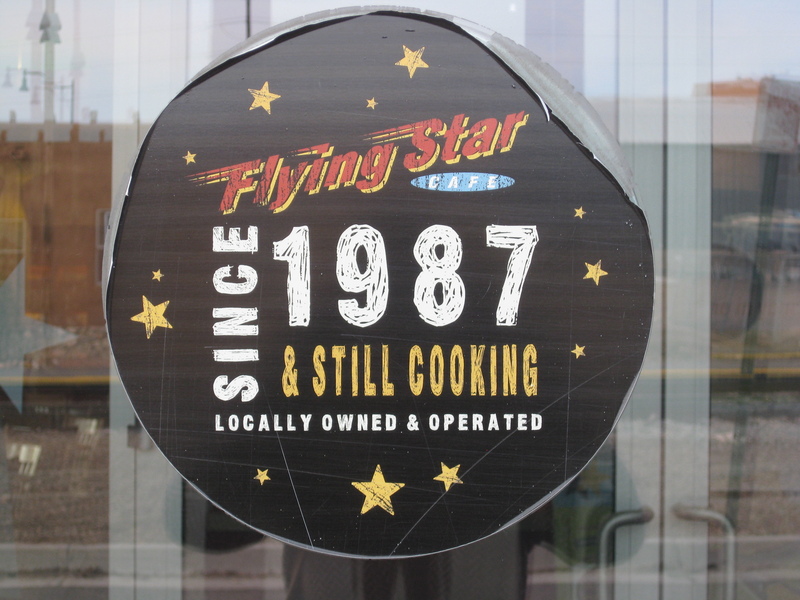 If people choose a vegetarian or vegan diet it is a personal choice and thank goodness places like Flying Star Cafe offer these options that are sustainably produced and often organic as well. It is often these big players who can make a real change that then benefits smaller businesses too. Jean told me that Sysco has instituted a green initiative that includes integrated pesticide management-IPM, which has brought a 90% reduction in pesticides used, and the installation of solar panels on long haul trucks has led to reduced diesel consumption for refrigerated trucks. 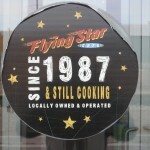 While these changes may be saving Sysco money and that may be their main incentive to make these changes, customers like Flying Star Cafe who keep coming back with more requests for greener products also drive corporate change. Just imagine if McDonald’s suddenly demanded humanely raised, hormone and antibiotic free meat and pesticide free potatoes what an impact that could make….anyone out there from McDonald’s reading this? Jean told me that they use a matrix for their buying criteria which makes sense for their business. Each business is different and this is important to keep in mind, for in the end you can’t make an impact if you go out of business. They have been trans-fat free for a long time, and they use only non-bromated flour. Did I mention that almost everything is made from scratch and this includes salad dressings, baked goods and even the buns for their burgers. This is a company that is big enough to move the big players, like Sysco, to be transparent and play nice. As we consumers demand clean, sustainably raised food it will become more available. Ask at your favorite restaurants where the produce comes from and what is in the meat they are serving. I have walked into restaurants and before I am seated ask what the animals were fed in the meat they serve. The answer that I get determines if I stay or walk out. It is up to us to let restaurants know that this matters and now so many healthier products are available so there is no excuse to not serve clean, sustainably raised food in restaurants, and not just high end ones as Flying Star Cafe proves. A quick word about their Satellite Coffee Houses…”Passionate about what they serve”. 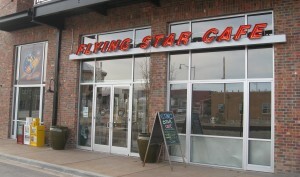 The same commitment that goes into everything at the Flying Star Cafe exists at their coffee houses. Their slogan is “Procurement with a Conscious. Use without Guilt” and they mean it. On their website they list all packaging products used, and the companies that they buy from. They roast their own coffee and it is organic and fair trade as much as possible, supporting smaller family and cooperative farms. Since I once had my own coffee house and lived in Italy for a few years I will admit I am pretty picky about my coffee. I haven’t been in a Satellite Coffee house as yet, but the cappuccino that I had at Flying Star was impressive and my next trip down to Albuquerque will include a stop at one of the many Satellite Coffee locations…watch out Starbucks I think that you might have some real competition in New Mexico.